Axiom's family of network server adapters provide a wide-range of solutions to boost network performance and improve IT flexibility. Available band-widths range from 100Mbs to 10Gbs on interfaces ranging from 32-Bit PCI to PCIe x8. Each adapter provides standard connector options from single port, dual port, quad ports in copper and/or fiber-based connections. 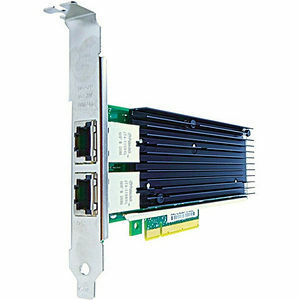 Axiom network interface cards accelerate applications with enterprise-proven connectivity. These solutions are available for designated branded OEM systems. Each Axiom network adapter is 100-percent tested to ensure long-term reliability and performance in high transaction and mission-critical applications. Maximizes I/O consolidation with high performance ports. Leverages and protects existing IT investments. Delivers cost reductions in operating expense and total cost expense. Provide connectivity and scalability required for enterprise environments. Achieve convergence - Run concurrent TCP/IP and storage (iSCSI or Fibre Channel) traffic over a single link.